Imagine spending half of your income on food. If you were a member of the American working class in the late nineteenth or early twentieth century, food would have been the largest item in your budget, more expensive than rent or the mortgage, than heating fuel, than clothes or schoolbooks or anything else your family needed. About fifty cents of each dollar went toward food. Imagine how carefully you would buy and cook your food if you spent so much on it: looking for bargains on wilted vegetables and stale bread, walking an extra mile to buy meat at a lower price, fastidiously saving leftovers to make soup. Would you try growing your own vegetables or raising chickens, or would you use that time to work longer hours and earn more money? Would you spend the time to bake your own bread from cheap flour, or would you look for a good price on day-old bread? If eggs were only affordable for a few weeks in the summer, would you buy several dozen and try to preserve them for the winter, or would you just go without eggs for much of the year? How would you cook and eat if you could barely afford enough food for your family? Millions of poor and working-class Americans in the late nineteenth and early twentieth centuries faced this problem-the problem of food-every day. Like us, they lived in a time of massive social and economic changes. Many were migrants or immigrants who had traveled hundreds or thousands of miles from their birthplace in search of work or to follow kin. The kind of work they did, their homes, their neighborhoods, and their household tools were all likely to be very different from those of their parents. The traditional ways of living, working, and supporting a family weren't always useful to them; they had to find new ways to live. Amid all these transformations, they had to face the following important questions every day: What will I eat? What will my family eat? Working-class people often spent about 40 to 50 percent of their family's income on food. The poorer the family, the larger percentage of their income they had to spend on food. The tools for cooking-stoves, pots, and pans-were also sometimes expensive, and the utilities that made cooking and housework easier, like running hot water and gas for cooking, were not common in poor neighborhoods. Men, women, and often children worked long hours to make enough money to survive, leaving little time to cook. And, perhaps most importantly, economic survival was uncertain. Everyday tasks like cooking were more difficult when family members worked different hours, some couldn't work at all because of illness or injury, and families might lack any income for long stretches when there was no work to be had. Studying the food of working-class people is a challenge because, although they probably made up the majority of Americans at the time, they left few records, especially about commonplace tasks such as cooking. Working-class people did not frequently read or write magazine articles about how to keep house and cook. They rarely used cookbooks, nor did their recipes find their way into the published books. With a few notable exceptions, including the Lower East Side Tenement Museum in New York City, their homes have not been preserved as museums, and their possessions weren't preserved because they were used and handed down until they became worn out. And working-class people who wrote memoirs and autobiographies were more often concerned with the struggle for social justice or personal advancement than with the mundane matter of what they ate. The largest body of evidence about the lives of working-class people of the time was generated by people of other classes, including journalists, nutritionists, doctors and nurses, philanthropists, social workers, and government researchers. These observers had a variety of reasons for investigating working-class lives, and were more or less critical, sympathetic, judgmental, or helpful. But they all considered food and cooking an important part of life that could be improved with study, and so they recorded reams of information about how working-class people cooked and ate. Government agencies studying the labor question gathered statistics on the price of food in relation to wages. Social reformers interested in nutrition estimated the caloric intake of working-class men, women, and children. Settlement-house workers and home visitors inspected kitchens, poked their noses into stewpots, and weighed the children of their immigrant neighbors. The information they gathered was shaped by social bias and political intent, and so it must be used with care, but it is invaluable in piecing together the food choices available to America's working people. Their observations and advice shaped the public dialogue about food, and in fact their ideas continue to influence the way we think about food and poverty today. Ultimately, however, individuals solved the problem for themselves in a multitude of ways that shaped our country, and the foods we eat, forever. WHAT DID THEY EAT-AND WHY? As working people rose early, they ate breakfast in the warming kitchen at dawn or carried it to eat on the way to work. Coffee or tea and a roll were considered sufficient by Jewish immigrants in New York. Mill hands in Massachusetts might have some beans and bread left over from the day before with coffee. Textile workers in the Piedmont had fried pork and wheat biscuits or cornbread with molasses. Single men in Detroit or Chicago might stop by the neighborhood saloon for a strengthening glass of ale before work. 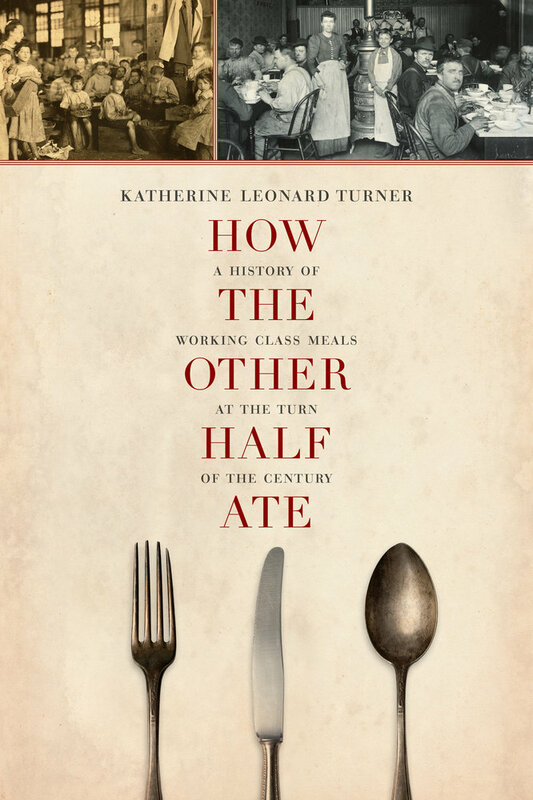 In the late nineteenth and early twentieth centuries, working-class Americans had eating habits that were distinctly shaped by jobs, families, neighborhoods, and the tools, utilities, and size of their kitchens—along with their cultural heritage. How the Other Half Ate is a deep exploration by historian and lecturer Katherine Turner that delivers an unprecedented and thoroughly researched study of the changing food landscape in American working-class families from industrialization through the 1950s. Relevant to readers across a range of disciplines—history, economics, sociology, urban studies, women’s studies, and food studies—this work fills an important gap in historical literature by illustrating how families experienced food and cooking during the so-called age of abundance. Turner delivers an engaging portrait that shows how America’s working class, in a multitude of ways, has shaped the foods we eat today. Katherine Leonard Turner received her doctorate in history from the University of Delaware in 2008. She lives and teaches in the Philadelphia area. 6. What’s for Dinner Tonight?